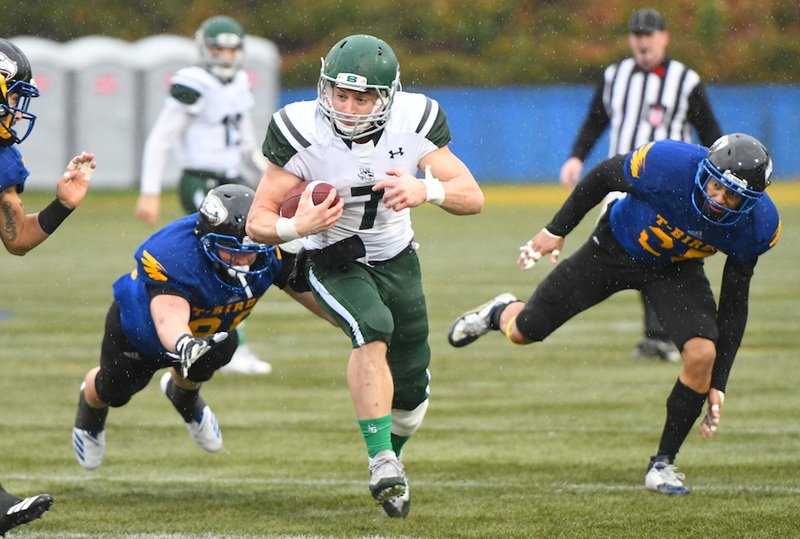 VANCOUVER — When it comes to advancing to the Canada West’s Hardy Cup conference championship, it’s almost felt like the UBC Thunderbirds have been protected by some sort of invisible force field since head coach Blake Nill rolled into town back in 2015. 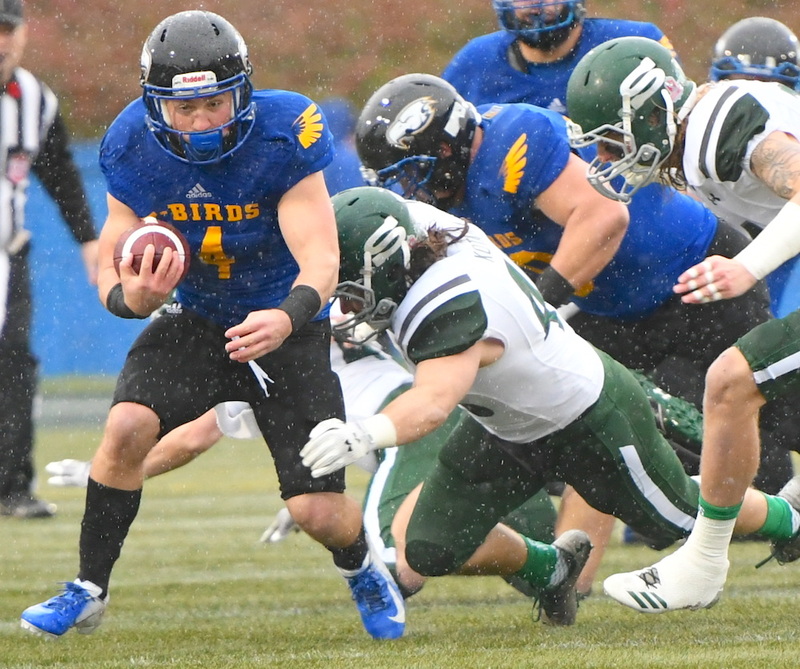 And with just over a minute left in the conference semifinal Saturday, with the comeback ‘Birds having just scored a touchdown to lead 28-21 over the visiting Saskatchewan Huskies, the prospects of returning to the Hardy Cup’s national quarterfinal stage seemed to be playing out in a decidedly blue-and-gold hue. In fact, when Huskies’ quarterback Kyle Siemens lobbed a vertical dart 35 yards down field into the fast-closing triple team coverage of UBC’s Stavros Katsantonis, Malcom Lee and Jordan Kennedy, the feeling was that you could almost take it to the bank. Katsantonis came down with the interception, and with 1:15 left in the game it looked like the force field was once again in activation mode. But then, for only reasons a higher football force can explain, it happened again. 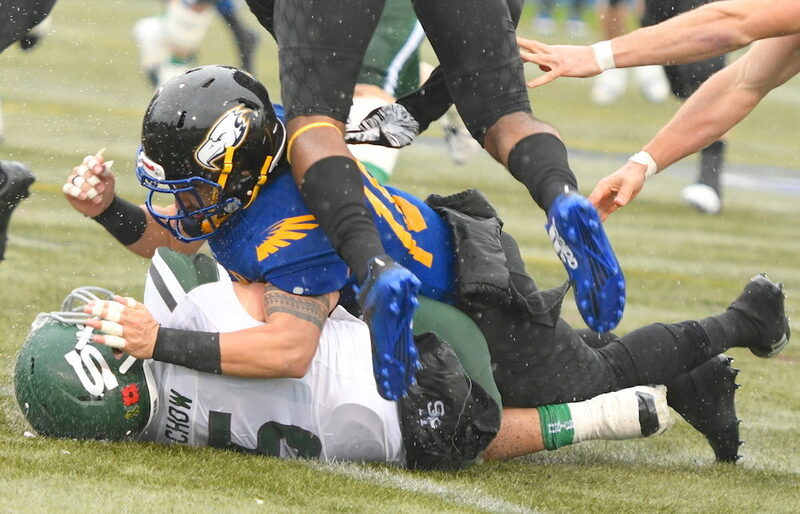 And when the dust had settled on yet another inexplicable loss, this one a 31-28 overtime flop that once again seemed to come out of nowhere, the Thunderbirds’ much-ballyhooed Vanier Cup journey had stalled a full four wins too early. “Right now it’s pretty low,” said Nill, after UBC unraveled at precisely the wrong time, setting the table for the Huskies to be the heroes after its punt coverage team was dinged for 26 yards on back-to-back penalties with 51 seconds left in the game. Instead of facing UBC for the fourth straight year in the Hardy Cup final, the Dinos will host the Huskies. Calgary beat Manitoba 37-13 in the other Hardy semifinal. Of course, it didn’t have to be this way. After the Katsantonis pick, UBC had more momentum than it did at any stage of Saturday’s game. After taking a 10-0 lead on a 25-yard touchdown strike from quarterback Michael O’Connor to running back Ben Cummings, and later a 12-yard field goal by Greg Hutchins, the ‘Birds proceeded to give up 20 straight points to the Huskies to trail 20-10 at the half, including a 16-yard Tyler Chow TD run set up by a rare third-and-11 onside kick that Stenger expertly placed from the 43-yard line to the 16-yard line where it was recovered by Colton Klassen. Yet like these UBC Thunderbirds have had the custom to do, they roared back, and in spectacular fashion to boot. O’Connor hit Blake Whiteley for a 24-yard touchdown, the first major the former West Vancouver Highlanders and Texas Longhorns’ tight end had scored after battling through five injury-riddled seasons. Hutchins came through a 21-yard field goal, and then O’Connor hit receiver Trivel Pinto on a four-yard TD slant, then hit him again on a two-point toss for a 28-21 lead. The Huskies’ rouge aside, it was an 18-1 run. It had to be enough. Saskatchewan should have taken over for their final drive of regulation at their own 37-yard line. 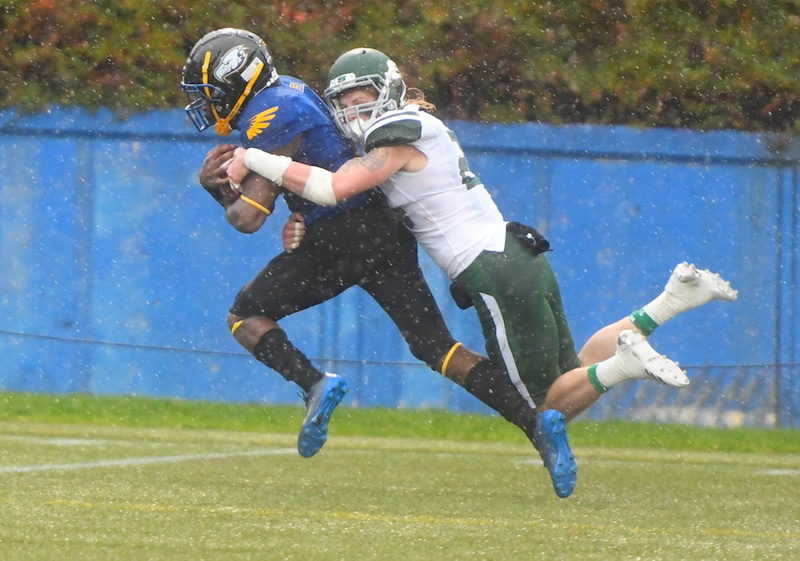 Instead, concurrent no-yards and face-mask penalties by the ‘Birds punt coverage unit literally chauffeured the football to UBC’s 47-yard line with 51 seconds left. Huskies’ quarterback Siemens, who was a less-than-impressive 13-of-31 with two interceptions before stepping under centre, threw for back-to-back first downs, then handed off to Chow for another. Siemens then connected at the goal line with a 14-yard scoring strike to Jesse Kuntz with 35 seconds remaining. The point-after by Stenger sent the game to overtime. UBC’s Hutchins, who has been brilliant this season and who has saved his team on several occasions, missed a 33-yard field goal to begin overtime. The Huskies took over and Stenger won it with a 38-yard field goal. Cummings, who had been hampered virtually the entire season with a leg injury suffered in teh team’s season-opening win over Manitoba in September, was helped off the field Saturday with another injury. He carried 14 times for 169 yards. Replacement Sharique Khan impressed during the ‘Birds rally, carrying eight times for 33 yards. UBC’s defence was led by the 10 tackles of second-year middle linebacker Ben Hladik, four of which resulted in negative Huskies’ yardage. Scan the UBC roster and there are 19 fourth- and fifth-year draft eligible players and the list runs the gamut from O’Connor, Pinto, Katsantonis and Hutchins, to defensive linemen Connor Griffiths and Sheriden Lawley, to defensive back Malcom Lee and running back Cummings. Put all of that to Nill just minutes after the loss and the coach first takes deep pause. Does it feel like a new chapter? “It does, to be honest,” he said. Throughout the stadium Saturday, UBC players could not hide their post-game disappointment. Receiver Lliam Wishart, who became a valued member of the team’s core of pass catchers, sat by himself in a corner of Thunderbird Stadium’s deserted stands, his helmet still strapped on. O’Connor, who left Penn State to come to UBC, had trouble finding the words as he emerged after the game from the UBC locker room. Where might he be next season? If professional football is not an option, O’Connor said he would welcome a return as UBC’s fifth-year pivot. On Saturday, O’Connor went 28-of-41 for 435 yards and three touchdowns, as he continued to add to his stature as the school’s all-time touchdown throwing leader. And with the way UBC players have accepted NFL training camp invites over the past few seasons, there is no telling where any number of ‘Birds could wind up on the next steps of their post-university journeys. And then there is Nill himself. When asked point-blank after the loss Saturday how happy he is at UBC, he answered in the affirmative while adding that his biggest adjustments over the past few seasons have come in dealing with a newer generation of players. Yet Nill doesn’t sugar-coat the 2018 season, one which stands as a bit of an outlier on his blue-chip resume. 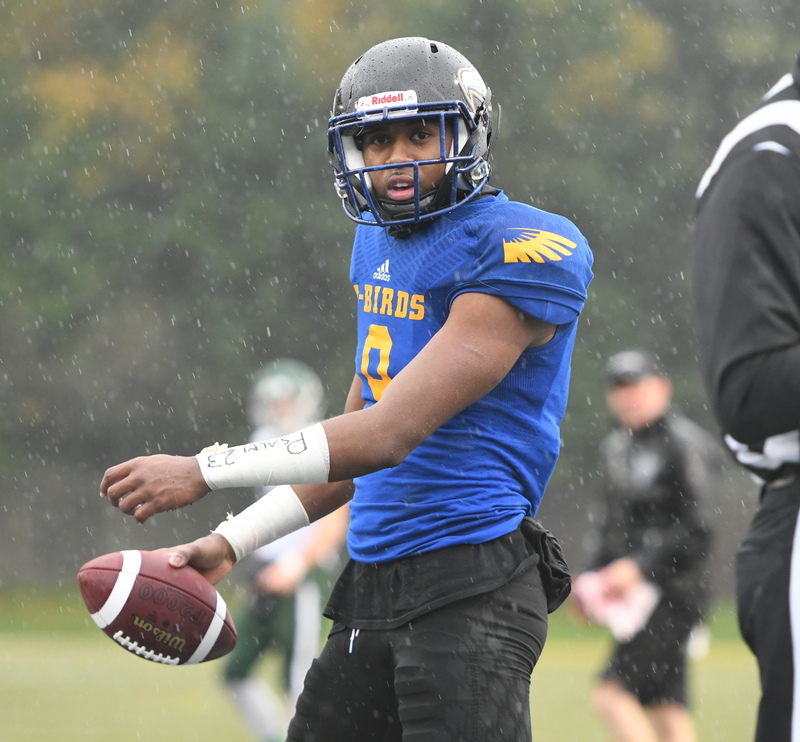 On Saturday, however, with change imminent, it looked a lot like a new chapter in UBC football was set to be written in 2019. If you’re reading this story or viewing these photos on any other website other than one belonging to a university athletic department, it has been taken without appropriate permission. In these challenging times, true journalism will survive only through your dedicated support and loyalty. VarsityLetters.ca and all of its exclusive content has been created to serve B.C.’s high school and university sports community with hard work, integrity and respect. Feel free to drop us a line any time at howardtsumura@gmail.com.